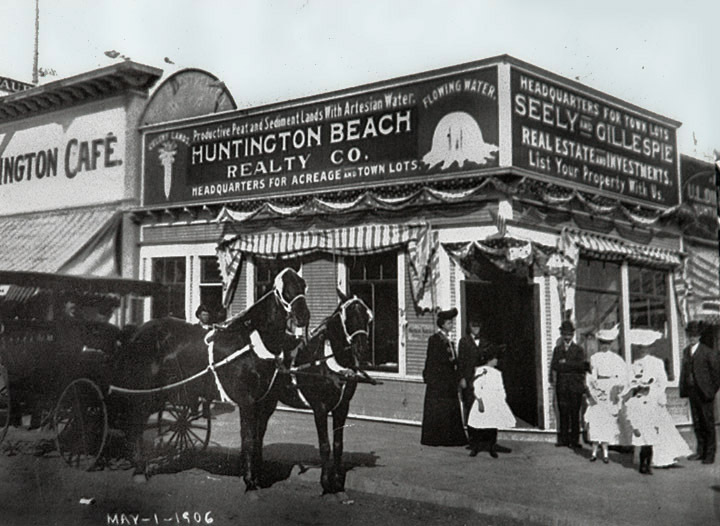 Huntington Beach Realty Company in the photo above shows the names of purveyors Seely and Gillespie who sold acreage and town lots. If you had kept that land, you would be a millionaire today. Houses in downtown Huntington Beach area cost over $1 million upwards unless the lot contains a humble, old beach cottage that will be torn down for rebuild. Eager to get Huntington Beach developed, the founders offered a special deal to Henry Huntington in exchange for his agreement to bring his electric Red Car to their city. They would name the city after this wealthy real estate magnate and hoped their town would develop and grow faster. It has been almost 100 years since the city was incorporated at Huntington Beach and the build out of the land is approaching. In the photo above, the selling points were productive peat and sediments with artesian, flowing water.